The code snippet feature allows you to copy and paste code over chat and preserve the code formatting. This must be enabled by the account owner or admin and requires a separate package download. Toggle Code Snippet to on (blue). It will now be enabled for your account. In your Zoom client, click your profile picture then click Settings. Check the Show Code Snippet button option. Your chat will now show a Code button. 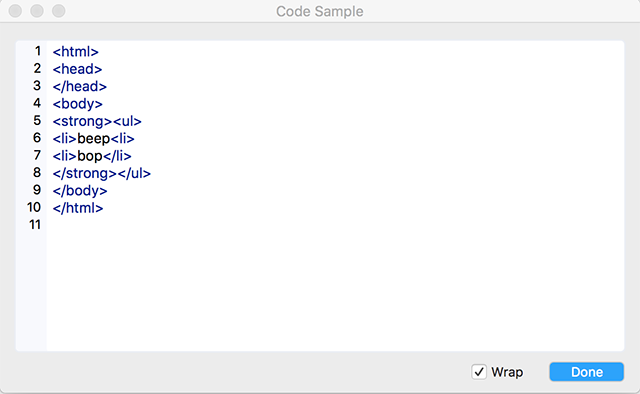 The first time that you send a code snippet, you will prompted to install the code snippet package. You only need to install it once on your computer, unless you uninstall Zoom. The code snippet package will install and after installation, the code snippet window will open automatically. After enabling the code snippet option, click Code. This will open up the code window. Title: Enter an optional title for your code snippet. Text: Select if this code snippet is text, or another type of code. Paste or type your code. Click Create Snippet to send it. A new window will open with the entire code snippet. Hover over the code snippet in the chat window. This will copy the code to your clipboard and you can paste it elsewhere.